I want to write again and, guess what?, I “get to” and even publish it as a blog if I choose. You know, I wrote my first blog in August 2013 when I was pondering whether or not to leave my job as a checker at Safeway and become a full-time artist. I was studying how to have a web-based business and one recommendation was to start a blog, so I did. But after numerous blog posts I found that my blogs were less business-related than recovery-related. You see, that is where I was in August of 2013. Having been blessed with the gift of sobriety in 1998 having found I could not “not go a day without a drink”, I sought help. And that 28-day treatment changed my life forever. But as we alcoholics stay sober “one day at a time”, we also can get unsober “one day at a time” by ceasing to pay it forward. I was taught early on that if I don’t give it away, I can’t keep it. Thus, I lost my sobriety because I stopped going to meetings, being of service, welcoming the alcoholic still suffering, and forgetting what it was like to be a newcomer. So today I stay close to meetings, service, and sponsorship and I have a contentment I never knew I was missing. I have peace and acceptance. I feel comfortable in my own skin. I don’t have to live fear-based. And I get to reap the rewards of working hard in my own business. 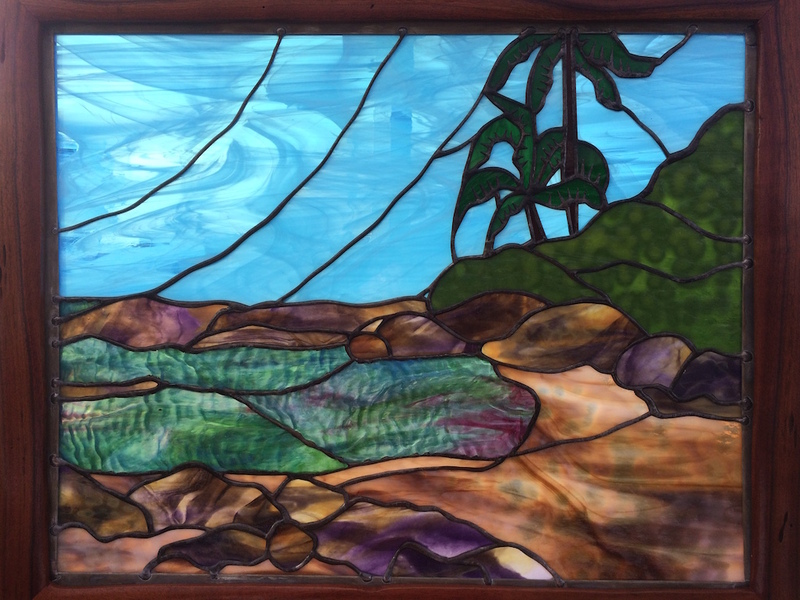 I have learned and grown a lot working Deesigns by Harris, my custom stained glass business. And I’ve still so far to go. It is exciting everyday to know I shall learn and grow the way I’m supposed to if I just get out of the way, not be in control, go with the flow and enjoy the ride. The Universe, God, my Higher Power, or whatever you want to call that power greater than myself provides me with what I need and everything is perfect at this very moment. Three years ago I started my Deesigns by Harris business by setting up a shop on etsy.com. I learned so much about e-commerce and, again, I’ve still so far to go. I published a website www.DeesignsByHarris.com (no longer available). I started my shop with primarily recovery triangles emphasizing “Unity…Service…Recovery” because that was (and always will be) my focus. Three years later I have included more Hawai’i and inspirational pieces to my line. Art that stirs up emotion. Art that makes one think…and feel. You see, I love to be able to think and feel today. I love the “I get to’s” of today. And I love not having to take a drink today. So I share that message via my art. I strive to create art that provokes optimism, well-being, hope, and self-acceptance. I have just opened a new website www.Deesigns-by-Harris.com and am working on opening up in new venues. My very first blog was titled “When I Grow Up I Want to Be an Artist…and an Alcoholic” (http://deesignsbyharris.blogspot.com/2013/08/when-i-grow-up-i-want-to-be.html). Today I am an artist. Today I am an alcoholic. Today is a great day! Mahalo for reading and for your interest. I shall blog every other week now with updates on Deesigns by Harris and life in general. Have a great day, sit back, and enjoy the ride!